【Key Important Note】: Adjust your phone to the best charging position. That is key important to decide your phone whether or not to get the fast charging. 3.Take off your phone case or using slim case, if the Protective cases that exceed 0.16 inch in thickness may affect wireless charging performance. 4.Fast charge mode, QC 2.0/3.0 adaptive fast charger requires a QC 2.0/3.0 adapter as its power source. 2 Installation Options for Choose: With an air vent mount and a suction mount. It is very firmly mounted on instrument panel / air conditioning outlet / Desktop.The 360 ° rotating spherical connector on both mounts has a flexible viewing angle when driving. Make you better watch your phone.lease install at the bottom of the air outlet, where could support the wireless charger firmly. 2-in-1 Function:The wireless charger combines the wireless charger and the handset bracket in one unit. So you can put the phone on your car when you drive. At the same time, you can charge through our wireless charger. It is not only for your car, but also for your office or your room. Faster Wireless Charging：Fast Charge Mode enables wireless charging up to 1.4⨉ faster,as fast as wired charging. Note: Remove protective cases to ensure effective charging. Unique Structure Design: The wireless car charger use mobile phone gravity and linkage principle. When the cell phone is put in, the left and right sides automatically grip the handset. One hand operates simple and convenient. Left and right arm Max Width: 3.6in/ 9.2cm; Min width: 2.0in/ 5.2cm. 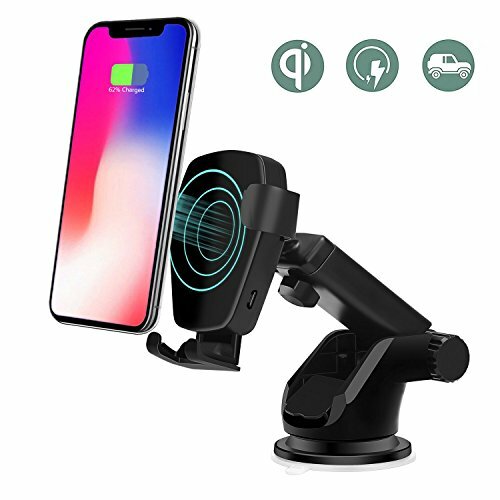 360 degree multi angle rotating arm free telescopic: Fitted or narrow clip when you use it in a car vents, spring push button to make stand even more stable.We providing friendly customer service, if you have any question, please feel free to contact us, 24-Hours Customer Service Support! If you have any questions about this product by Lottogo, contact us by completing and submitting the form below. If you are looking for a specif part number, please include it with your message.